This 3rd floor unit at Boardwalk is a brightly decorated 3 bedroom/2 bath unit, is gulf front, and located in the heart of Gulf Shores. 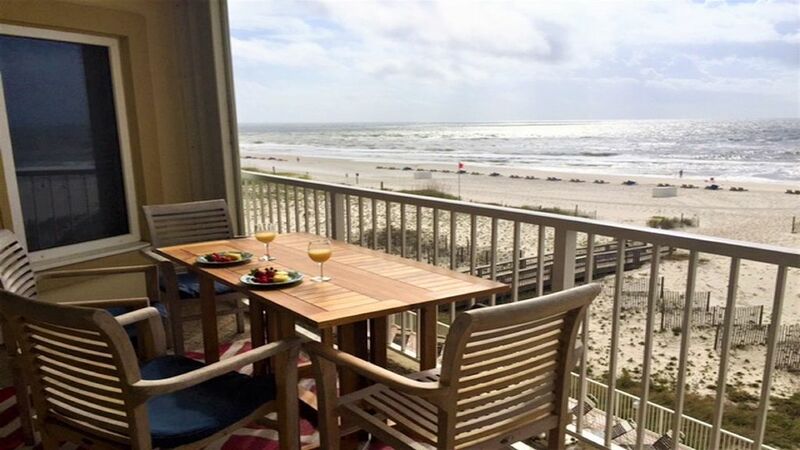 Relax on the balcony at the end of the day and enjoy the sound of the surf and a beautiful ocean view. The balcony overlooks the spacious pool perfect for swimming and sunbathing. There is a fully equipped kitchen with a microwave, refrigerator with ice maker, dishwasher and oven. Don't feel like cooking? Make a phone call for takeout or walk to the 'Sea and Suds' restaurant located on-site. Other nearby restaurants include 'The Hangout', 'Hooters', 'Mikee's', and 'The Steamer' The multi-purpose walking and bike lane is located directly in front of the condominium complex and allows safe walking to these nearby restaurants. Other local attractions include an outlet mall, golf courses, Gulf Shores zoo, 'Waterville', and 'The Track'. For ocean enthusiasts, parasailing, deep sea fishing, and dolphin tour boats are also only minutes away! View from almost every room! Parking is included. There is parking on site and extra parking across the street. Bath towels are provided. You bring your beach towels. There are 2 elevators in a smaller sized complex decreasing wait time! The living room and each bedroom have a television. The pool has a large deck with plenty of lounge chairs and tables. No need to hurry in the morning to reserve a chair! Awesome, Awesome, did I say Awesome! Great contact with property owners. Condo was clean, and actually ready for us sooner than check in time in which we were informed. Great view, and easy in easy out to go exploring. Would definitely stay here again, no question. Third year coming here. It just keeps getting better and better! Fabulous condo, balcony, and beach! We had a great time all around. Perfect location to do all we wanted to do. This Condo was very nice. It was nicely decorated and clean. Perfect location for walking to Sea and Suds which is directly in front of condo. Hangout isn't that far to walk either. Nice pool and the beach is in front. We had no problem with parking at the condo either. I will stay there again! The FREESE'S. Great place to stay. Location is perfect. Nicely mainained unit. Plenty of room for us. Owners were easy to contact. We enjoyed watching the dolphins play in the ocean. Happy we missed the horrible Missouri weather the month of January. Everything was very good. Enjoyed the property and the area. Great location, pleasant place to stay. We had a very nice stay at this condo! Not too big or too small, right on the beach, 3rd floor so not too high. Enjoyed eating on the nice balcony with table and chairs. Loved the great food & super casual dining at Sea & Suds (right on the beach behind the condo). The market across the street was helpful too. Only 2 negatives - the second bedroom was pretty dark & no beach view (everyone wanted to be in the Master Bedroom with gorgeous views). And, the stove, oven, and some pans were dirty (need some glass top cleanser), but not too big a deal. All appliances worked well - ice maker was a bit noisy though. Lisa was also very responsive to our questions over HomeAway messages!